On our recent trip to the MIT Sustainability Summit, we had the pleasure of staying at the Hotel Marlowe, a luxury boutique Kimpton hotel in Cambridge, Massachusetts. With city skyline or canal views, the Marlowe offers luxurious accommodations in addition to being conveniently located minutes from downtown Boston and walking distance to MIT and other Boston attractions. Upon entering the Marlowe courtyard entrance, you are greeted by a 25-foot armillary sphere inspired by the celestial realms. Adorned with luxurious furnishings and a vintage scientific flair, the Marlowe is incredibly alluring. In addition to their chic decor, the Marlowe holds sustainable values and standards which are reflected in their guest amenities. As a guest, you will enjoy several exceptional amenities, including a hosted wine hour every evening in the lobby. From 5 – 6 PM you can mingle with guests while discovering new wines from their socially responsible wineries around the world. The Marlowe also emphasizes healthy travel services. 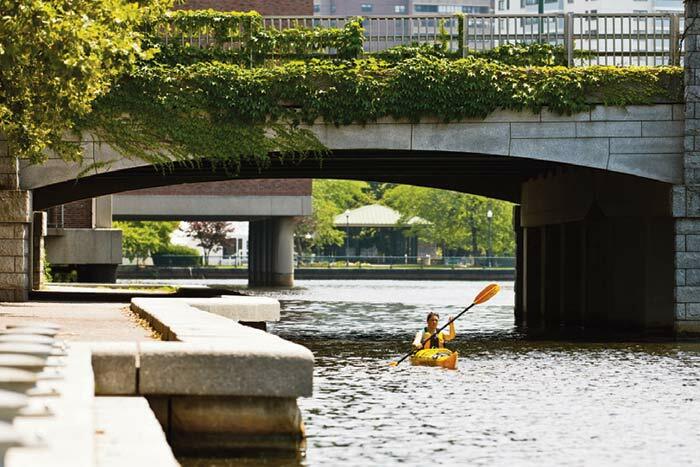 PUBLIC bikes are available for a ride around town as well as complimentary kayak use to enjoy the Charles river. More health conscious amenities include a yoga mat in every guest room, along with a fully equipped 24-hour fitness center. Across from the lobby, you will discover Bambara, a fine dining restaurant, serving breakfast, lunch and dinner. Complimentary coffee / tea is served from 6 – 9AM in the lobby living room, rounding out the eco-chic amenities to be experienced at the Marlowe. Before you make your reservation, you may wish to consult the pre-concierge service, which prepares your room with wine, a fruit platter, assorted truffles, or a custom request of your choosing. The accommodations range from guest rooms to pet-friendly hotel suites. The Marlowe offers vibrant, contemporary rooms complete with flat-screen TVs and free WiFi, pillowtop beds, modern desks, armoires, and a private bar and mini fridge. The Marlowe’s suites provide additional living space, floor-to-ceiling windows, and telescopes to take in the skyline or canal views. Plush robes and complimentary chocolates complete the Marlowe’s rich experience. To discover historic Boston, we made our way to some lesser known spots including the Brattle Book Shop, one of America’s oldest and largest used book shops. The Brattle features two floors of general used books, a third floor of rare and antiquarian books and an outside sale lot. After this, we ventured to Boston’s historic Park Square for an Italian dinner at the Rustic Kitchen. Known for their warm and comfortable atmosphere, excellent entrees, and fine wines, Rustic Kitchen proved to be a fabulous dinner spot for a night out in downtown Boston. In addition to their incredible food, they also feature “The Cooking Show” in an adjoining studio kitchen, hosted by Chef Liz Bramwell. When enjoying Boston Common, we recommend venturing across the street into Thinking Cup, a popular coffee shop serving Stumptown and Third Wave Coffee. Recognized as the “Best Coffee in the World” by NPR, The New York Times, and Food & Wine Magazine, this quaint cafe is filled with the sweet-smelling aromas of their freshly-ground beans and offers mouthwatering pastries and sandwiches. They also offer gluten- and dairy-free bread and pastry options (which are delicious). We rounded out our trip with a visit to the Boston Museum of Science, where we took in a show at the Planetarium. While it may have been a bit of a grammar school throwback compared to our experience at MIT, we thoroughly enjoyed the artificial tour-de-force of the universe and cosmos. While our experience of Boston barely scratched the surface of what the city has to offer, it was a memorable visit to a remarkable city. Boston is moving closer and closer towards sustainability. It’s becoming increasingly easier to experience this historic, innovative, and intellectual city while being eco-friendly. There is something for everyone in Boston. Whether your visit is for work or pleasure, be sure to make Hotel Marlowe your stay of choice. Take in the popular attractions, but don’t forget to branch out and discover the underground gems of this eclectic city.